There are 4 rockers available for placement on the Welcome Center Deck facing the Entry Garden. You can select from two options for engraving. The top and bottom seat back boards can be engraved with 12 characters per board or the first seat board can be engraved with 13 characters all including spaces. 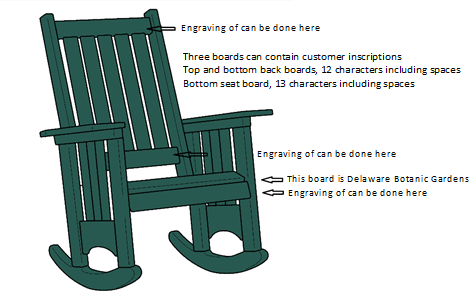 With either option, “Delaware Botanic Gardens” will be engraved on the second seat board.